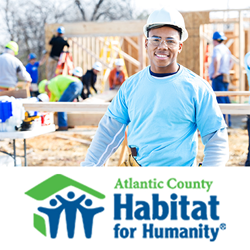 Marc Ludwig, agency principal of Ludwig Financial Group, Inc. in southern New Jersey, is announcing a charity drive to help generate community support for the ongoing efforts of the local Atlantic County chapter of Habitat for Humanity. “It’s important that our community can work together to make sure every family can achieve the American dream and enjoy a safe, secure home to live and raise a family in,” says Ludwig. To encourage community involvement in the two month long event, Ludwig and his team are using referrals to direct donations to the charity. For every person referred into Ludwig Financial for a no obligation appraisal on a new insurance policy, the Ludwig team will make a direct donation to Habitat for Humanity. Additional information on how to get involved has been provided here: http://ludwigfingroup.com/rewards/. As a Personal Finance Representative in Egg Harbor, agency owner Marc Ludwig knows many local families. His knowledge and understanding of the people in his community ensures that clients of Ludwig Financial Group, Inc. are provided with an outstanding level of service. Marc and his team look forward to helping families protect the things that are most important – family, home, car and more. Ludwig Financial Group also offers clients a preparation strategy for achieving their financial goals. To contact an expert at Ludwig Financial Group, visit http://ludwigfingroup.com/ or call (888) 288-2150.